"Herzog’s world — especially as revealed by the abundance of signs — is simultaneously covetous and quasi religious, sensual and unworldly. 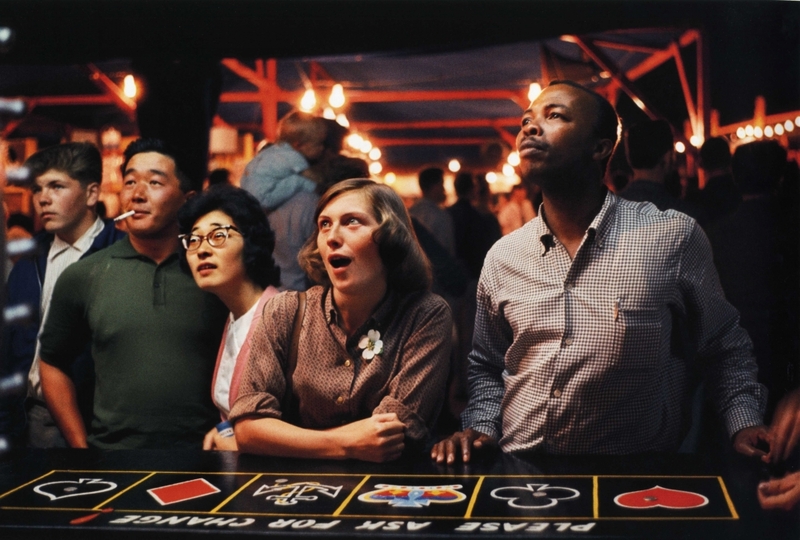 Gamblers at a fair or casino gaze beyond the frame in an ecstasy of optimism, keeping faith with the idea of an against-the-odds windfall (a.k.a. a miracle). The relatively lengthy shutter speeds necessitated by Kodachrome — a slow, not very light-sensitive film — meant that Herzog was not only temperamentally unsuited but technically unable to snap events on the fly in the sly manner of Cartier-Bresson. Drama passed him by. He waited for time either to slow down or to come to a functional standstill. In lieu of the fast time of second hands and their snatched fractions, a strong sense of photographic history can be seen to converge on Herzog’s work. Herzog, born in Germany in 1930, immigrated to Canada in 1952. Although he took some photographs in various places in the world, Vancouver remained his colorful stamping ground from the late 1950s onward. As with Leiter, the sense of a distinct and determining sensibility is enhanced by the relatively limited geographical frame of reference. Because the same bits of real estate crop up in multiple frames, a given view can be triangulated with other shots so that we are enclosed within an artist’s world. To look at Herzog’s work is to inhabit it."